This compressed zip folder contains the 5 Unit 3 stories in second grade. Each story includes spelling, vocabulary, and high frequency word lists and activities. Also included are two file of additional spelling practice. **The spelling word list includes the 12 pattern spelling words & the "frequently misspelled words" found on "Day 3" in the teacher's edition. 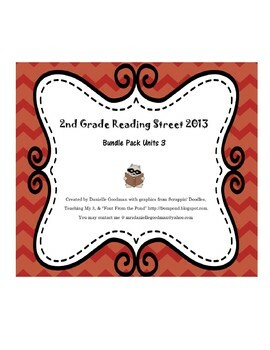 Be sure to check out all of my other resources for 2nd Grade Reading Street! Let me know if there are other resources you'd like to see.